Preliminary estimates indicate that Latino voter participation and support for Democratic Party candidates on Tuesday were similar to the 2010 mid-terms – but not enough to overcome the Republicans’ gains across the broader population. Before Tuesday, Latino observers were excited that 1.2 million Latinos had registered to vote since the last mid-term elections (2010) and, with an estimated 66,000 American Latinos turning 18 each day, they would have some new clout. Latino Decisions, the leading polling organization focused on Latinos, found that two-thirds of Latino voters in Texas supported Democrats in House races on Tuesday, and 74 percent in Georgia supported Democrats. Their broader impact as a bloc, moreover, is hard to assess because most of the competitive races for the U.S. Senate and House of Representatives were not in states with concentrated Hispanic populations. Gerrymandering also blunted their impact on House races, and new voter identification laws appear to have discouraged participation as well. The Dallas Morning News reported last weekend that Texas state officials estimated that the laws would render more than 600,000 registered black and Latino voters unable to cast ballots (without breaking out the size of each group). Latino Decisions had warned before the elections that enthusiasm for Democratic candidates was 11 percent lower than it was during the general elections two years ago. Many Latinos were angry that President Obama backed off his plan to use executive authority to begin immigration reform, while at the same time, ironically, they were frustrated that the Democrats saw them as a one-issue constituency and did not include them on other issues. Indeed, Voto Latino, a voting rights organization, and others have been warning that Latinos care as much or more about the economy, health care, and women’s rights but feel ignored. (The polls show that Latinos feel even more shut out by the Republicans.) The great pool of young voting-age Latinos has been “hardest to reach,” according to Voto Latino, because they are busy and turned off by the stereotyping. The Democrats also seem to have communicated priorities poorly. Colorado Senator Mark Udall played up his support for comprehensive immigration reform, but Latino Decisions says only 46 percent of Latino voters there knew it. On the other hand, Nevada Governor-elect Brian Sandoval – a Republican – attracted Latino voters with a platform emphasizing Medicaid expansion, English-learning education initiatives, while downplaying his party’s rhetoric on immigration. The margin of Republican victory was wide enough that even high Latino turnout wouldn’t have flipped the outcome in places like Colorado, North Carolina, and Georgia. 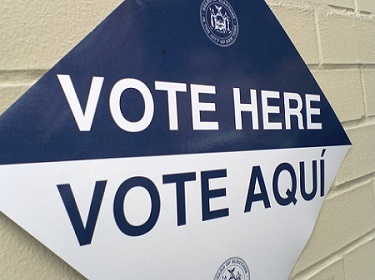 Tuesday’s results notwithstanding, however, polls by Latino Decisions and other research indicate that the Latino voice at the polls will grow and, when mobilized, be potentially decisive. Despite strains with the Democrats, it’s hard to see Latinos jumping to the Republican Party unless it significantly shifts policies on immigration, social programs, voter-ID laws, and the economy. It would be unfair to blame President Obama alone for the lack of a Latino surge this year, but his decision to back off on immigration clearly hurt his party badly. He wanted to take heat off vulnerable Democratic senators but helped neither the candidates nor his party’s ability to mobilize Latinos. Latino Decision’s data on low enthusiasm and dismay about the delay of executive action mean that if the administration doesn’t take real action soon – and work to build Latinos’ enthusiasm over the course of the next two years – it will diminish prospects for the Democrats to have a big Latino edge in the presidential race in 2016. With a Republican-controlled Senate, Obama faces the same dilemma as before – to risk the Senate’s wrath by taking executive action on immigration or continue to alienate a key constituency – but the answer should be clearer in view of Tuesday’s results.